WSU culinary certificate program students Abigail Dahlin, Brittany Jacobs and Sherlane Yuen, l‑r, preparing hand-made pizzas at Maialina Pizzeria to thank veterans for their service. Pizza and patriotism were a complementary pairing for local veterans who were treated to a hosted lunch prepared by students in the WSU Carson College of Business culinary certificate program. 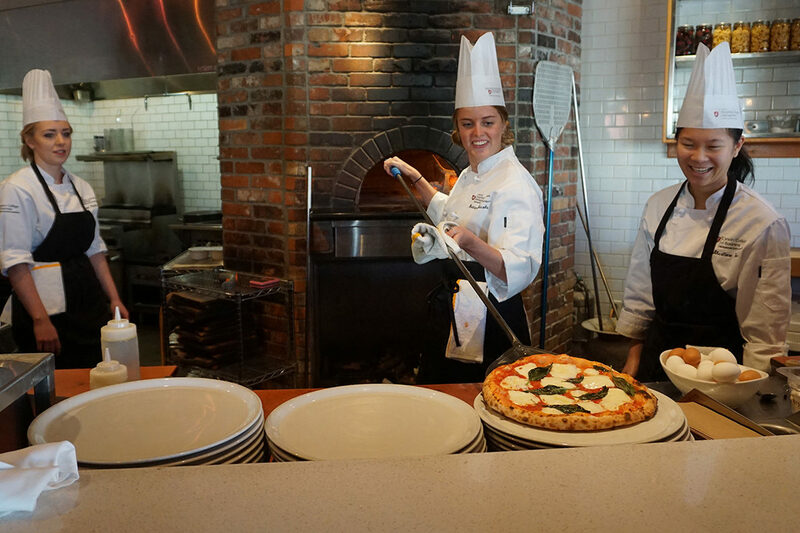 Executive Chef Jamie Callison coordinates the certificate program and planned to have students participate in a four‑hour pizza lab experience in partnership with George Skandalos and Carly Lilly, owners of Maialina Pizzeria in Moscow. As it turned out, the lab, in which students would be making a lot of pizzas at the restaurant, happened to fall on Veterans Day. “I like to volunteer in community opportunities that connect to my own life,” says Samantha Lutz, a WSU junior majoring in hospitality business management. Lutz plans to be a chef and a restaurant owner. About 50 veterans were served as a result of the culinary learning experience. Skandalos and Lilly plan to make it an annual event, closing the restaurant to the public so veterans and their families are exclusively recognized. Both Skandalos and Lilly are enrolled in the certificate program and are giving scholarship support to five of their employees who are in the program as well. They believe charity starts at home. Certificate students Ava Powell and Jeremiah Sprague are prime examples. They are both sous chefs at the Birch & Barley restaurant in Pullman. Powell’s goal is to increase her skills so she can find employment opportunities in Calgary’s competitive culinary scene. Sprague is taking the certificate to improve his knowledge and skills after falling in love with cooking at Birch & Barley, where’s he’s worked for two and a half years. The college launched the American Culinary Federation Education Foundation Apprenticeship Certification Program in 2018 through the WSU School of Hospitality Business Management. The program is designed for culinarians working full‑time, professional chefs working towards certification, and WSU full‑time culinary or food and beverage-focused students. Program highlights include ACFEF national certification, a WSU School of Hospitality Business Management culinary certificate, mentoring from qualified, professional chefs, developing documented culinary skills, and acquiring professional work ethic.